Once you've mastered the controls, it's time to get geared up! Go get those juicy sticks and rocks! 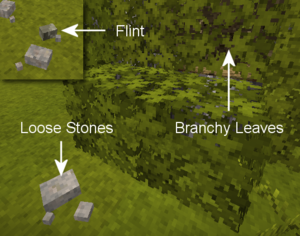 First of all, acquire a hand full of flint or stones - you'll need one each to make basic stone tools. Tools made from flint will give last a bit longer than ones from basic stones. Spears are a useful means of self defense. They have a long attack range and can be thrown. Once you got some flints or stones, hold left Shift to sneak and right click on solid ground with the flint or stone in your hands. When you use stone, you have to right click a second time. It offers you a small dialog where you can select what you want to craft. Use a second flint or stone to chip away all voxels marked in orange. Don't worry about making mistakes, the game prevents you from breaking the parts you need. Flint can also be obtained by flint ore found in various stone types. It can be mined with just a rock in hand. Simple stones can also be thrown for minor damage and other players can help you knap if they have a flint or stone in their hands. Most importantly you will probably want to explore wide and far for crops and berry bushes to secure your food situation. Crops can be planted on any soil after tilling it with a hoe, but grows best on high fertility soil. Crops also require a nearby water source. Ripe Berry Bushes can be harvested and afterwards broken+replanted anywhere else. After a while they will start to bloom again. Animals can be killed for their meat. Use Sneak + right mouse click with a knife in hands to harvest dead animals. Hold on to the seeds and berry bushes until you found a place to settle down. 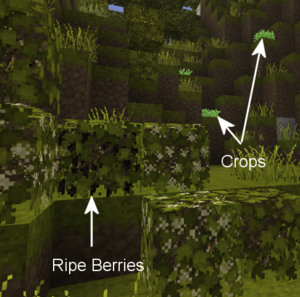 Berries bushes can be planted without metal tools, don't need nutrients, and can heal the player. Your second priority should probably be to ensure a source of light because the nights can get pretty dark. Torch: Provides good lighting at a low cost, but only lasts for 3 days when placed. Created by "cooking" a stick in a firepit. A firepit will allow you to still see something when the sun sets, cook meat and create torches by igniting sticks in it. Put dry grass in your active hand, then sneak + right click on the ground, then add firewood with the same method. Different Fuels burn at different temperatures and durations. In a burning firepit you can add sticks in the top left slot to turn them into torches, or meat to have it cooked. Dropped items disappear after 10 minutes while in loaded chunks. You can store them in stationary containers to avoid losing them. As long as you don't have your first pickaxe, your only way to reach ore smelting temperatures is by burning charcoal. To create charcoal craft an axe, chop down some trees and turn them into firewood. Dig out a small ditch on the ground and fill up the hole with firewood. Cover it up with non-combustible blocks, except for the one in the middle. Place a firepit there and quickly cover it up. You need at least 32 firewood on one block to be able to place the firepit. After 18 ingame hours the pit will stop smoking and the firewood will have converted to charcoal. Your ditch can be of any shape, just be sure that all sides are covered up, i.e. you can also make pyramid shaped pile on the surface and cover it with dirt if you like. Careful: After the fire pit is placed you have 30 seconds to completely cover up the pit, otherwise your firewood will burn down to ash and not yield any charcoal, thus it is recommended to have all sides covered before placing the fire pit. Again, until you have a pickaxe you will have to scavenge the surfaces for loose pieces of copper ore. Once you collected a few dozens you are ready to leave the stone age. Note: Surface ores are always an indicator of near surface deposits. If you dig down just below where the surface pieces were you are very likely to find a deposit. Clay deposits are commonly found in temperate climates. Go ahead and dig up a bunch. You can also craft a flint shovel to speed up the process. For molds you can use any kind of clay. 3. Select the recipe for crucible, and you will see the clay molding grid appear. 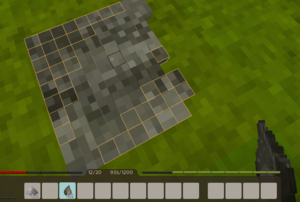 To craft you must fill (right mouse click) in all the green marked voxels to place clay and remove (left mouse click) any clay blocks outside of the grid, which are marked orange. It's helpful to press 'G' to sit on the ground while crafting with clay molds. Also, you can press 'F' while crafting to access the tool menu that will allow you to place more or less blocks with each click. 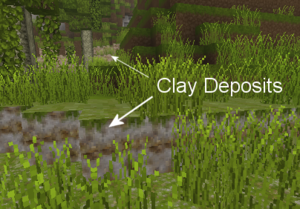 The last option in the tool menu also allows you to quickly duplicate layers of clay. We recommend you try and acquire also pickaxe and a sword mold. 5. Once the crucible is baked, move it back from the right slot to the left slot inside the firepit. This will extend the dialog by 4 additional slots. These 4 slots can now hold your ores for smelting and alloying, once placed the ores will begin to heat up, and if the smelting temperature is reached, smelt. The smelting process is complete once the crucible jumped into the right slot. 6. Pour your molten mix into the molds. Once the molten metal has cooled to below 20% it's melting point (usually around 200°C) you can take out your tools or ingots. 7. Repeat this process for the tool mold of your desire. Later on you might want to acquire a hammer and and axe. Other players can help you craft clay objects as long as they are also holding a piece of clay just like with knapping. It also works for smithing with hammers. Don't make an anvil until you want to craft higher level tools such as shears, saws and scythes as casting is generally the faster method for creating basic tools. Early copper age tool casting is easy and fun but prevents you from creating some of the more advanced tools and weapons, such as the saw, shears or the metal version of the spear. 4. Fill the forge with bituminous coal, lignite or charcoal and your desired metal ingots holding shift + right mouse click. Ignite with a torch. 6. Your goal is now to fill in the empty blue squares with metal. Hit 'F' with a hammer in your hand to see your tool modes. The first mode spreads metal in all directions, the next 4 in a single direction and the last one removes a piece of metal. If your work item cools down too much you will need to reheat it on the forge. 7. 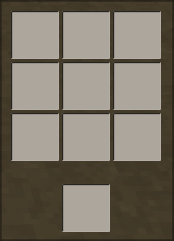 The axe currently requires 2 ingots, you can see the available amount of spreadable metal in the block info. Place another hot ingot on top of the work item for refilling. Some anvil recipes like the axe and shovel take more than one ingot if you smith it but only one if you cast it. Creating bronze works in the same way as when you create copper, however, you will have to find some extra ingredients to create one of these 3 alloys. Mix them inside the crucible according to these ratios. Be aware that some ores contain fewer units of metal than others, as shown in the tooltip information. You will need to find the right ores, the prospecting pick can help you with that. Black bronze is a mixture of copper, gold, and silver. It has the highest durability and strength of all bronze alloys. You don't need to know the ratios as you can also guess your way to them just by trial&error in the crucible. The firepit dialog will tell you if you got a valid combination. Iron tools will give you again a significant boost in strength and durability. Make sure you have a bronze anvil, as you won't be able to smith iron tools on a copper anvil. Sneak + Right click the base to add fuel and ore. It won't accept fuel whose burning temperature is too low. Bloomeries can smelt any ore actually, at a higher temperature than the fire pit, but cost significant quantities of fuel. It is currently the only method to smelt iron ore and quartz. Sneak + Right click the base with a torch in hands to ignite the bloomery. Once the bloomery stopped smoking you have to break it to pieces in order to get to the goodies. See the prospecting pick page. This page was last modified on 8 February 2019, at 21:21.